Often, when you crack open a beer with friends, your buddies are more focused on texting and Snapchatting than what's happening right in front of them. Smartphones have wedged their way into bars around the world—but an innovative new beer glass is encouraging patrons to put down the phone and engage with friends. 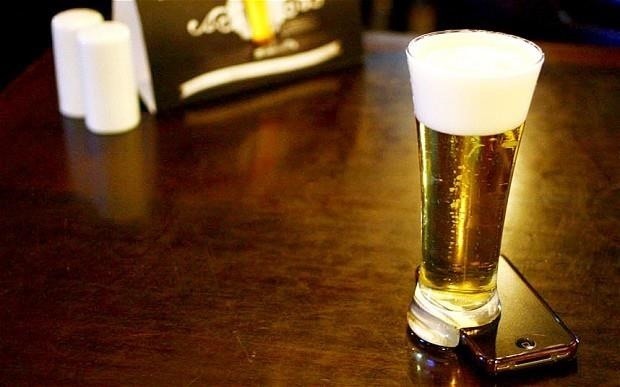 The Offline Glass is a beer glass that can stand only if a cell phone rests beneath it. With an iPhone-sized notch cut into its base, the Offline Glass requires drinkers to place their handheld device on the table. The glass then rests perfectly on your smartphone. Want to check your texts? Better pick up your glass and take a drink! If the smartphone support is removed, the Offline Glass immediately tips over and spills its contents. Of course, tipsy drinkers might accidentally kill their smartphone (unless it's a newer waterproof Samsung Galaxy S5 or Sony Xperia Z2)—but the risk of wet iPhones is worth the reward of seeing people engage face-to-face. Currently, the only place to experience the Offline Glass is the Salve Jorge Bar in Sao Paolo, Brazil. But who knows: maybe the next time you want to enjoy an ice cold brew at your favorite bar, you'll need to swap your phone for a conversation-friendly glass.